This beautiful 14K white gold crescent moon necklace from Apples of Gold Jewelry will shine on during the day and throughout the night! The shining 14K white gold moon has a 1mm cable chain attached, which is adjustable between 16" and 18" in length. This makes the necklace perfect if you prefer to have the option to change where it sits while wearing. The chain has a spring-ring closure. 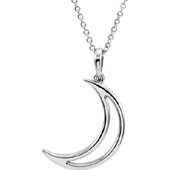 The moon pendant measures 7/16" tall by 3/16" wide and is shaped like a perfect crescent moon. 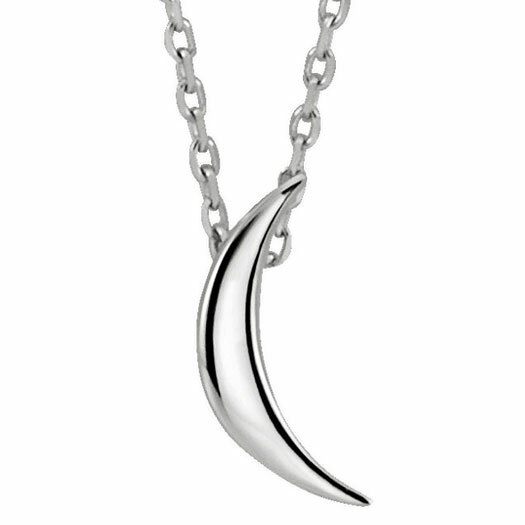 We guarantee our 14K White Gold Crescent Moon Necklace to be high quality, authentic jewelry, as described above.